Over this past year, my colleagues and I at WeRobotics spent several weeks working in tandem with three UN agencies (UNDP, WFP and UNICEF), and an array of government, private and non-profit stakeholders in six countries: the Dominican Republic, Peru, Malawi, the Maldives, Mozambique and Myanmar. We had a single aim: to improve the coordinated, safe, ethical and efficient use of drones in humanitarian action. We witnessed the front lines of climate change and sea level rise, explored novel responses to damage assessment and flooding, worked with smart and energetic young people, and saw the first stirrings of robotics and big data as part of the toolbox available to disaster responders in the Global South. 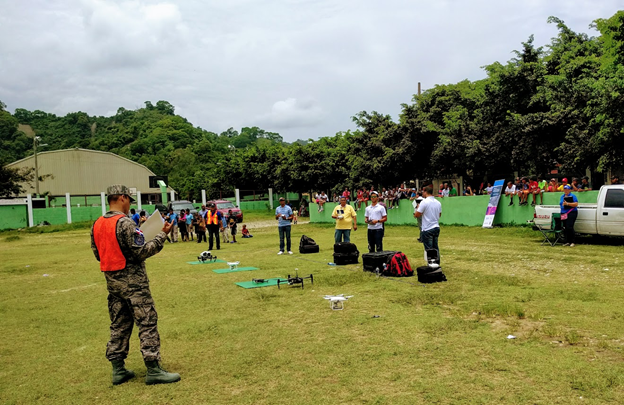 Everywhere we went though one idea stood out: if drones are going to fulfill their humanitarian potential, the structures, skills, and knowledge that guide them cannot depend on large international agencies or rapid importation at times of crisis. Drones are primarily a form of remote sensing, allowing high-resolution access to hard-to-reach areas. They’re being used at least in preliminary ways by disaster responders to produce 2D and 3D maps, to monitor vegetation and water, to assist with imaging for search and rescue efforts, and even potentially to provide remote communications support through aerial Wi-Fi hotspots. However, the permissions and situations required to use them demand the presence of operators at the scenes and in the communities impacted. Community engagement is a core principle of the World Humanitarian Summit and the Humanitarian UAV Code of Conduct. Humanitarian drones must be localized. Descending over the blue-green expanse of the Maldives archipelago one is struck not only by the physical beauty of the place but by its obvious fragility and sheer physical scope. Across 90,000 square kilometers of the Indian Ocean lie the atolls that make up the planet’s lowest-lying country. Practically every one of them barely pokes its head above water. More than half of the Maldives’ population lives on just two islands toward the southern edge — the capital Male and its artificial counterpart, Hulhumale. Although the risks are low here of major disasters, Maldivian geography is such that even a small storm surge can become a significant flood. With so much territory to cover, retrieving information by drones for disaster relief could be near-impossible if they had to come in from outside the country or be sent from the capital. Amid a rapid onset emergency, how could teams be ferried from the capital to points of need? If drone operators aren’t already on site by the time disaster strikes, they probably will not arrive in time to be useful. That means emergency responders have an enormous stake in localizing humanitarian drones for each of the country’s regions. The operational model which the Maldives applies to distributed disaster resilience is called the “Community-Based Emergency Response Team” (CERT). These voluntary teams exist on each island and receive training to operate as a first line of defense everywhere in the country. The United Nations Development Program (UNDP) and the Maldivian National Disaster Management Center (NDMC) recognized a couple of years ago that CERTs needed to play a role not only in providing emergency services but also in collecting data and assessing post-disaster situations. As it turns out, the Maldives is such a young and photogenic country that commercial drones are available on almost every populated island, in the hands of many people also working in the CERTs. That makes the Maldives a perfect test case for community-based humanitarian drones. In mid-2016 and again in February of 2017, WeRobotics teamed up with UNDP and the NDMC to build upon training activities undertaken separately with the drone manufacturer DJI. Rather than focus on the expansion of drone hardware capacity, after consultation with a range of stakeholders from government, academia, non-profits, and the private sector we recommended two key approaches: 1) deepening data integration, processing, and analytics capacity to make sure that digital tools and intelligence are prepared to support response operations throughout the country, and 2) leveraging the CERTs by encouraging the use of volunteered geographic information, social networks, and the incorporation of drone operations into emergency responder training. This plan is being implemented and holds promise for small island states to use existing resources for expanding humanitarian drone use. Of course, effective applications of community-based humanitarian drones also require strong support and coordination at the national disaster management level with those responsible for organizing crisis information, managing multi-sector actors, authorizing response plans, and distributing resources, as well as with international actors during large-scale crises. In conjunction with the World Food Program (WFP) and the Emergency Telecommunications Cluster (ETC), WeRobotics undertook a series of workshops and practical simulations throughout 2017 to figure out what those coordination structures might look like, where the gaps may lie, and what we in the international community can do to help fill them. In May of 2017, a team from WeRobotics landed in Santo Domingo, the Dominican Republic along with colleagues from WFP to begin the first in a series of exercises aimed at figuring out how to create coordination structures for humanitarian drones. We were joined by actors ranging from national disaster and civil defense managers to the Ministry of Agriculture and a selection of NGOs. The mandate of this work was to balance needs for standardization so that humanitarian use of drones follow global best practices in safety, communications, analysis, and other areas, with requirements for customization to specific conditions where disasters may occur. Each place has strengths and weaknesses in systems, differences in regulations and constellations of response actors, as well as variations in the types of emergencies likely to occur. Without accounting for these variances and building them into the heart of our humanitarian coordination practices, international standards may not mean much in practice. The Dominican Republic faces significant risks from coastal and inland flooding, as well as serious seismic risks like those faced by neighboring Haiti in the devastating 2010 quake. It also has a thoughtful regulatory approach premised on safely and broadly incorporating UAVs into civil airspace rather than excluding them. Nevertheless, they face huge challenges in drone implementation, not the least of which is the big data challenge posed by aerial imagery. While we were able to recruit some talented pilots to fly missions during the simulation, the processing of aerial data in the field, performed in this case with Esri’s Drone2Map, ate up crucial hours. Extraction of useful information from the imagery took even longer, in some cases past the conclusion of the simulation itself. That experience drove home the idea that localization of humanitarian drone capacity cannot end with regulatory reform and hardware access but must also localize analytics and geospatial capacity, so that drones don’t become an even greater problem for local responders due to a deluge of data. A few weeks later, these insights were again borne out on the coast of Peru, the setting of the second workshop and the scene of massive flooding in March and April. 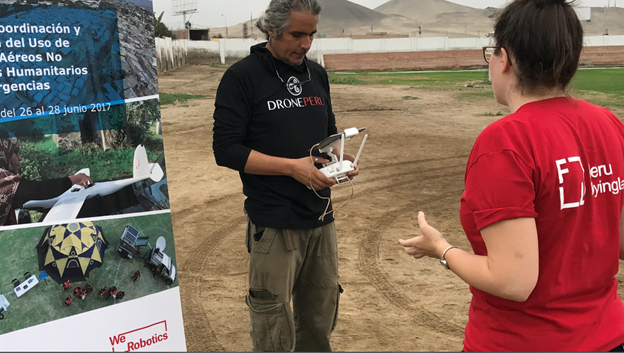 Peru is in many respects further along with UAV deployments than much of the global South, with a burgeoning local industry, a broad selection of use cases, and exciting social partnerships, such as Peru Flying Labs and the DronePeru network. Nevertheless, during the simulation communications between different actors were quite challenging, often leading to duplication of efforts even within a relatively small space. Likewise, real-time image processing and feature extraction proved nearly impossible, leading to ad hoc efforts to find points of interest from the mass of visual data. Other areas of concern included humanitarian drone training, developing tasking practices for pilot teams, and building a roster of skilled individuals distributed throughout the country for voluntary action under the umbrella of national disaster management — which is reminiscent in many ways of the Maldivian emphasis on Community Emergency Response Teams (CERTs). 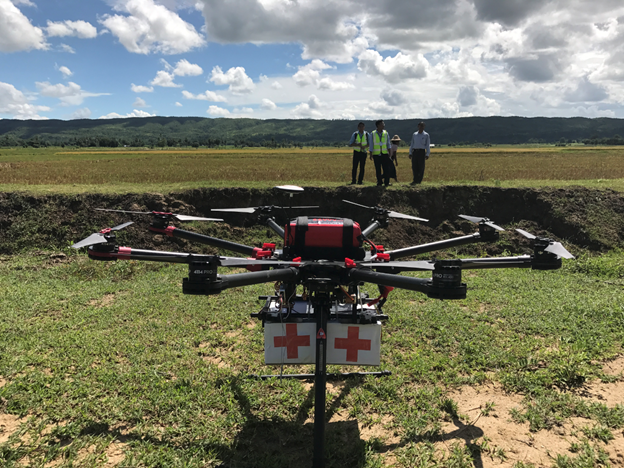 Across the world, in Myanmar, the regulatory and political situations faced by drone pilots and emergency responders are almost entirely different. The setting of the third workshop, Myanmar is in most respects more vulnerable to disasters than the countries visited thus far, due to the routine occurrence of powerful storms which cut up through the Indian Ocean. Myanmar is also far less welcoming at the regulatory level of drone pilots, going so far as to threaten prison for those found flying without licenses. The constrictive regulatory environment hasn’t dampened the spirits of the engaged and enthusiastic drone practitioners throughout the country. While they faced many of the same challenges regarding communications, data, and analytics, they also displayed an innovative spirit in setting up remote area networks for moving data around during disasters in the field, and in many cases built their own equipment. In Myanmar as well, given the diversity of communities and territories throughout often very remote at-risk areas, many challenges with key areas of interest for aerial data collection could be streamlined by incorporating local actors into humanitarian drone teams. The fourth WFP-sponsored workshop, in Mozambique, brought to light the distinctive challenges of southern African nations attempting to leverage emerging UAV technologies. Mozambique, for instance, currently has no drone regulatory system in place. While they are considering a series of regulations based in many ways on the South African system, it is unclear at this point whether South Africa’s rules fit Mozambique as well as, say, those of their neighbors in Malawi. Yet, here too, strong work is being done throughout the country with aerial data, which could be repurposed for localized humanitarian drones. The NGO ThirdEyeWater is running regular drone flights to improve agricultural productivity. UNDP, too, has begun supporting the national disaster management agency with hardware transfer and access to processing software. Mining companies and other private sector entities possess drone capacity which could be leveraged for disaster response. A leadership cadre has begun to emerge in Mozambique’s non-profit, private, and public sectors, which could, with support, develop into a strong partnership basis for humanitarian deployments. Mozambique may also be able to lean on regional collaboration with partners such as the emerging humanitarian drone community in Malawi. 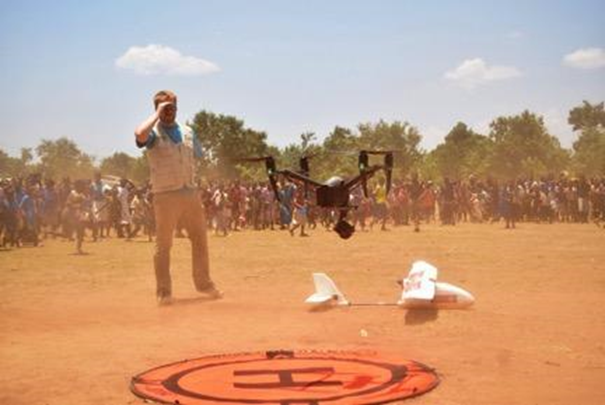 Although one of the poorest countries in Africa, Malawi — thanks in many ways to the tireless efforts of UNICEF — is also a hotbed of aerial innovation and one of the last in this year’s workshop schedule. A humanitarian drone corridor has been established here to encourage safe and responsible humanitarian field testing. Cargo delivery of essential medicines and diagnostics is already underway at the pilot stage. In Malawi, the regulatory environment mostly allows for the flexible implementation of drone projects. Still, the big data problem persists. This problem is compounded by challenges with Internet connectivity. Moving data from the field to analysts and to headquarters, especially heavy image files, is simply not practical now. Neither is it merely practical to rely on the current local geospatial capacity to effectively process and analyze data in the field. It’s likely that lessons from Malawi and the other countries WeRobotics engaged this past year point towards the urgent need for better and more user friendly automated image classification, as well as training and capacity building activities in geographic information systems (GIS) as part of localizing humanitarian drone capacity. As we’ve seen the world over, from the Maldives to Malawi, drones on their own aren’t valuable unless they’re embedded in strong analytic, policy, and partnership networks. This integrated local approach is the core principle of WeRobotics’ work in humanitarianism, which we’re calling AidRobotics. The activities that makeup AidRobotics focus on building knowledge, skills, and technical capacity at all levels of government and amongst local networks of non-profit and private stakeholders at the forefront of global risk. The mission of AidRobotics will be to ensure that humanitarian drone applications remain a shared effort responsive to community needs and priorities. We are also responding to demand for better analytics support with the announcement of the Open AI Challenge through South Pacific Flying Labs. We must build this future together. We invite interested people across the world to join us in the exciting next stops in the journey towards community-based humanitarian drones.